Wang had a wide variety of peripherals that were used across many CPU types. Wang sold various bundles of CPUs with peripherals as system packages with many configuration options. Wang also encouraged customers to upgrade to higher end systems, made possible by the very good hardware interchangeability and excellent software compatibility between the different systems. This flexibility lead to a blurring of where one configuration ended and where the next began. Still, this section will attempt to give a quick overview of common configurations. 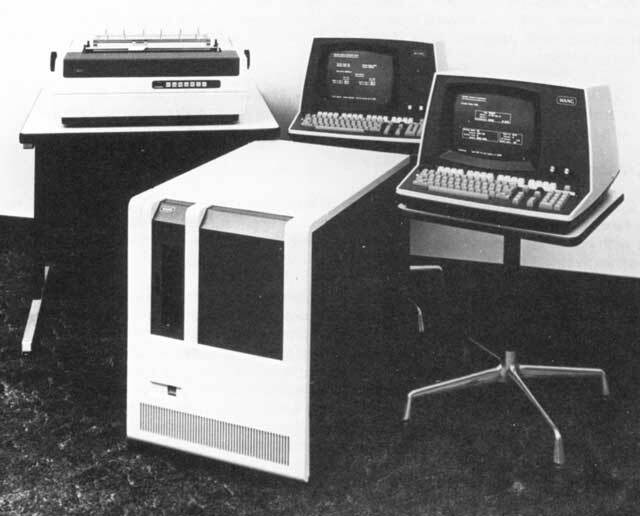 Wang made first shipments of their 2200 computer in May, 1973 . Over time, various kinds of peripherals were developed, and enhancements were made to Wang BASIC with new microcode. These were aimed mostly at engineering and scientific applications, a market Wang was already connected to via sales of their scientific calculator families. These systems were sold built out of a modular collection components, tailored to the needs of each customer. A system would be pieced together by the selection of microcode option, a terminal, some type of storage system (cassette or disk, typically), a printer, and whatever specialized I/O card was necessary. There was no obvious attempt to establish a bundle identity. 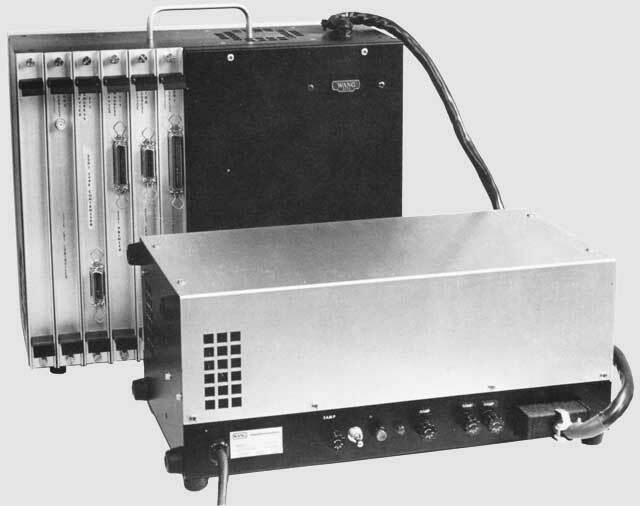 In the picture above, note that the A/B/C models have the external power supply (the box in front), while the S and T have integrated power supplies. Low-end: WCS/10 is 2200T CPU, tape storage, 64x16 terminal. Starting at $6100. Mid-range: WCS/20 is 2200T CPU, one floppy, 80x24 terminal. Starting at $11,200. High-end: WCS/30 is 2200T CPU, one floppy, 80x24 terminal, 5M fixed/5M remove hard disk. Starting at $25,700. The WCS/10 configuration wasn't very common. The /20 and /30 options were very common and a lot more useful since they contained disk systems. 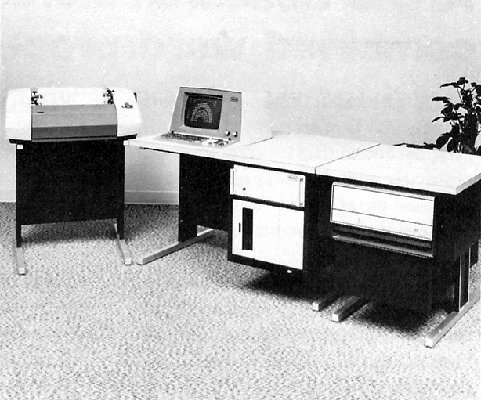 Systems also came with very heavy desks that were custom made to hold the CPU and the various peripherals. Sometime in early 1977, Wang started offering the WCS/40. This was a higher end configuration including an MVP CPU and a hard disk system, capable of supporting multiple users at once. In September 1977, at Wescon, Wang introduce the WCS/15 model . Wang's announcement said it was positioned between the Wang PCS-II (low end) and the WCS/20 (high end). 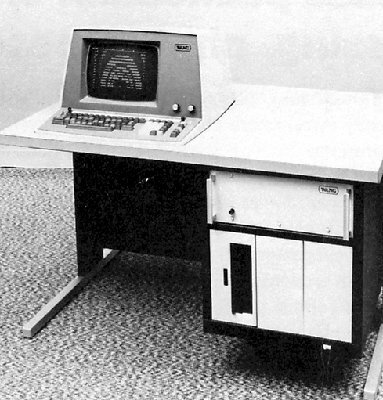 The standard WCS/15 configuration had 16 KB of RAM, a 12-inch CRT, one disk drive, contained in a desk-styled piece of furniture. 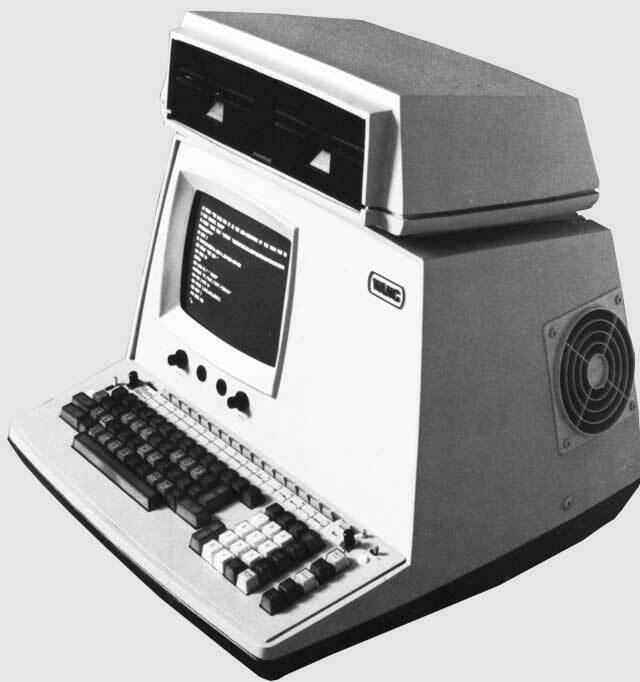 March, 24, 1976, saw the introduction of the Wang PCS computer. PCS stood for Personal Computer System. Although it looked very much like the standard Wang 2220 and 2226 terminals, the CPU and some common peripheral controllers were repackaged to fit into the terminal housing, getting rid of the ungainly metal "suitcase." Specifically the 2200E/F CPU was used with either the 2200E (cassette option) or the 2200F (disk option) backplane to address two market segments. 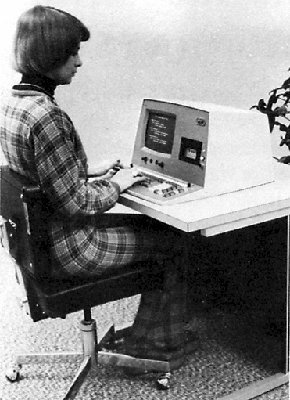 The PCS was aimed directly at countering the recently introduced IBM 5100 portable computer . 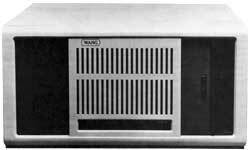 Wang's advertisements touted the feature improvements over the 5100 (such as a much larger screen), but mostly focused on the lower price: $5400 for the PCS vs. $8975 for the IBM 5100. Upgrading the PCS from 8 KB RAM to 32 KB would cost an extra $4400 (24 KB for about $14000 in 2003 dollars). In early 2013, I received an interesting email from Alvin Ginsburg. He has given me permission to share this story. The 2200 had in interesting impact on the IBM techies. I bought a Wang 2200, and HP 9830 and an MCM/70 and kept them in my office. This was also an idea that was revolutionary. In management's mind you couldn't just go out and by a computer within a normal budget and fit it in your building, let alone your office. One day I was presenting to the development vice president, Dave Slattery, that we could build a machine with 4k and a tape cassette that could run BASIC (and APL.) He called the director of programming systems, Yves Masson. They decided the best they could ever have done was 128K. They laughed at this young upstart (me) fresh from the sales office. So, I walked out of Dave's office, went to my office, wheeled my 2200 back to Dave's office and said, Dr. Wang can do it, and so can I. Those days in IBM they had a silly system called "non-concurrence." Anyone could slow down a project by filing one, that said a thing conflicted with their thing, or didn't do whatever. In the next case the program manager for APL, Curt Bury, filed one because we were emphasizing BASIC instead of APL. (Our prototype did run APL.) So, I spent a few more bucks to get some market research. Visited Dr. Bury to explain that the world knows, and uses, BASIC. Therefore I would sell the 5100 with BASIC, then nurture the user into trying APL. Then the user might get excited. So, by introducing the product with BASIC built into the system, I would create a market for him. He thought this was brilliant and withdrew his objection. And the programmers did figure out how to build an interpreter in 4K. I think I will write more on it. There were a lot of fun things in exposing management to this idea that you could really put a computer on a desk top without even having a raised floor. A simple example. John Opel, then el Presidente' was in Atlanta for some meeting. Someone, other then me, took charge to get me on his schedule to demonstrate the prototype. Since John was downtown in the Peachtree Plaza Hotel, they rented a room where we could be secreted. Turned out all they could get was a giant ballroom. Then a couple of engineers crated the thing in a giant box and brought it as checked personal baggage on a plane from California. They paid a small fortune in excess baggage fees to do so. They then set the machine up in the ballroom on a dining table and posted guards at the door. Since they didn't have the power supply ready, they brought a gigantic laboratory power supple and put it under the table, supposedly hidden by the tablecloth. So, I am demonstrating when Mr. Opel sees this gigantic cable running from the machine to the floor. He suspected that I really was just showing him a terminal connected to a large computer somewhere. So, he followed the cable to the power supply, which was bigger then the computer. He said "Jack Rogers (then our division president) told me that the proprietary breakthrough was the power supply. Is that it? I explained that this was a laboratory power unit, and that the inventor, Ray Harper, the division IBM Fellow, was creating the real power supply as we speak. I didn't mention that I had seen Roy copying the power supply from a drawing in Popular Electronics magazine. I never did find out where Jack got the idea about the power supply being unique. I can't say you now have the rest of the story since there is a lot more. For example, carrying the unit around corporate headquarters in Armonk. Alan Krowe, then senior vice president in charge of finance is sitting with the machine on his lap. He loves it, says he wants one. I said, Alan it will cost you four million dollars. Instantaneously he says "I'll take the second one." Simultaneously with the PCS, Wang introduced the 2200WS . This was essentially a PCS system with 8 KB RAM and no cassette and no disk storage. 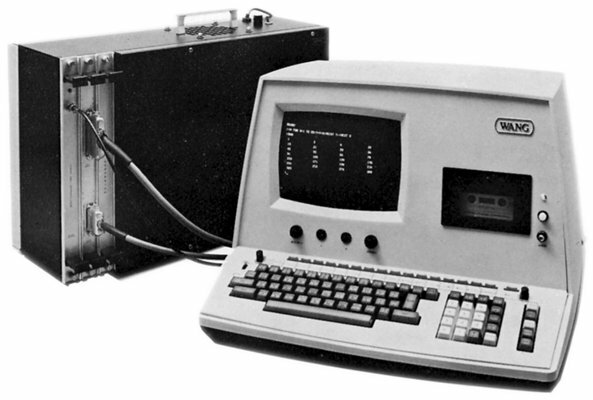 Instead, it contained a disk controller interface that hooked up to a WCS/30 system configured with a disk multiplexer. Up to three 2200WS machines could share the disk with the WCS/30. Prices started at $4900. By June, 1977, Wang had introduced the PCS-II. This was a PCS system that had a dual 5.25" floppy disk system bolted on top of the terminal. Perhaps the most significant feature was that this was the computer that the 5.25" floppy was invented for. Wang decided that 8" drives would be too cumbersome for this class of machine, so they contacted Shugart for development of the smaller drives and media. The PCS III was basically a 32K PCS-II with a disk mux. It could talk to the 2230s and 2260s but not the Phoenix. I think the other options were the same (24x80, 2nd floppy, TC ports, etc). It isn't clear to this website author exactly what the common system configurations that the VP series were sold as (e.g., as the WCS/30 was a bundle for the 2200T CPU). Clarifications to this section are welcomed. As mentioned earlier, the VP CPU was announced in Wescon in September, 1976, along with the improved BASIC-2 language . As it shared a common I/O bus with the first generation 2200 CPUs, customer upgrades were possible by swapping their existing I/O cards and peripherals into a new CPU case. In the picture above, note how the I/O cards (foreground) are the same as for the first generation CPUs, but the portion of the box housing the CPU (rear of picture above) is much taller. This is because the cards implementing the CPU and memory were larger in the VP family. Wang began deliveries of the MVP CPU in March, 1978 . The MVP was identical to the VP CPU except the addition of a 30 ms one-shot timer to determine time slices for multitasking, plus a banked memory scheme for allowing more total memory (although the per-process memory remained the same). With the MVP, Wang introduced a terminal multiplexer and the 2236D terminal. 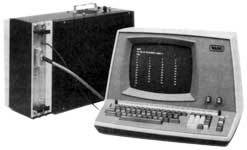 Previous 2200's used a CRT controller that was accessed locally; the terminal multiplexer and the terminals communicated via a serial protocol, which used run-length compression so that a run of repeated characters (most typically spaces) could be sent with just two bytes. Up to 12 terminals could be connected to one CPU by using three multiplexers. At some point before 1981 the SVP was introduced. It was something like the VP but in a much smaller form factor. To provide some sense of scale, that is an 8" floppy drive on the right hand side of the machine. 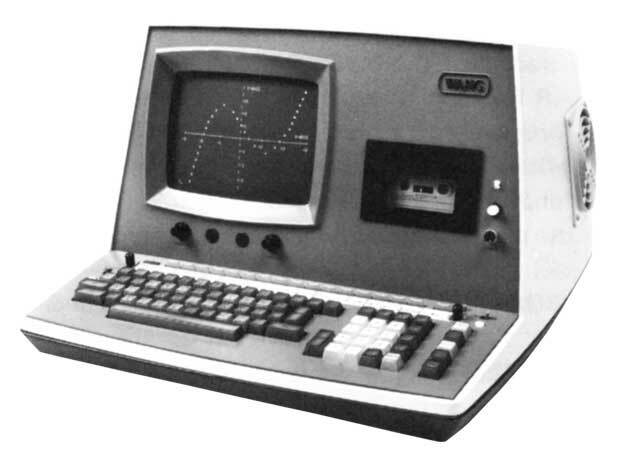 It was sold as a single user system with one 8" floppy and one winchester hard disk, although one option was to have a second floppy instead of the winchester. It also used a more densely integrated DRAM so the control memory fits on one board in the SVP (vs. two for the VP) . The 2200SVP is a compact, single-user, high-performance business computer. 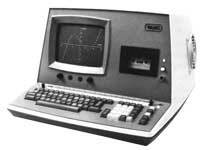 The entry-level system is available with 32 KB of RAM expandable to 64 KB, terminal, and telecommunications. Maximum disk storage is 5 MB. 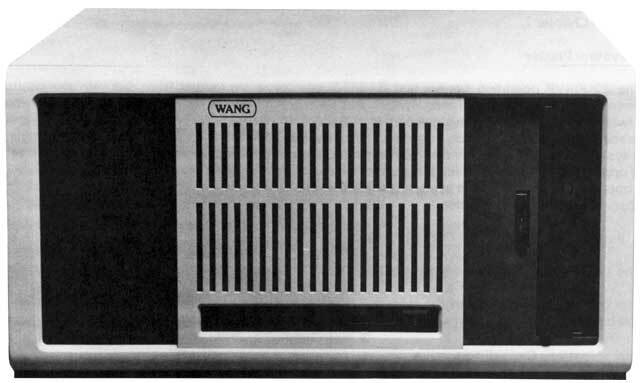 At some point before 1981, Wang began selling the LVP system. The LVP was a compact system (about the size of a mini refrigerator) containing an MVP CPU plus disk controller cards and a Shugart SA 1000, an 8 MB hard disk drive. In a normal system, the disk controller cards are located in the box housing the floppy disks or hard disks. In the LVP, these cards plugged into the CPU backplane. It was intended to support up to four users. The backplane has room for 15 cards (probably most of that was for adding more low density RAM boards) plus seven I/O expansion cards . At some later point (probably late 1981) the MVPC and LVPC were introduced; it was also possible to upgrade an existing MVP/LVP system to an MVPC/LVPC system. The "C" enhancement was to allow doubling the control memory to 64 Kwords, enough for BASIC-3 (never released) and COBOL (never released). Another facet of the enhancement was to add on more DRAM bank select bit, allowing up to 512 KB of system RAM (up from 256 KB). Finally, the LVPC allowed using a Quantum 16 MB or 32 MB disk drive instead of the standard 8 MB Shugart SA 1000 disk. 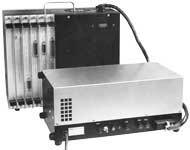 In early 1987, Wang introduced the 2200 CS-N and 2200 CS-D systems. The -N suffix means the box housing the CPU does not contain storage, while the -D suffix means the box contains three storage bays. 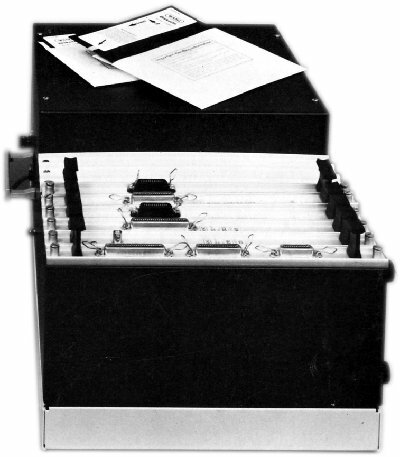 The bays could hold any combination of 5" hard drive, 5.25" floppy drive, or cassette streaming tape drive. A common configuration was one of each. The CS-N and CS-D used the same MicroVP CPU implementation that Wang had used previously, so this product was just a repackaging of functionality. With the CS family announcement, Wang renamed BASIC-2 as CS Multiuser BASIC-2 OS Release 3.0. It offered some minor enhancements to the language, including allowing the user to enter keywords in either upper or lower case. In mid 1989, Wang introduced two new systems, the CS/386-N and the CS/386-D. These were the same systems as the CS-N and CS-D, except the MicroVP CPU was replaced with the 386 card that Wang had just developed. According to Gene Shulz, the 2200 Product Manager at the time, the CPU was designed by Wang's Taiwan R&D office, but debugging was done at Lowell, Mass. The CS-N and CS-D used the same MicroVP CPU implementation that Wang had used previously, so this product was just a repackaging of functionality. The CS/386-N and CS/386-D versions were identical, but rather than using the MicroVP, it used the 386-based CPU. To confuse matters further, any VP-based system could be upgraded by swapping out the old CPU and plugging in the CS/386 card. A 2200 CS can be seen in Jan van de Veen's Small Wang Museum. Even though it was produced so much later, it used the same heavy sheet metal construction and I/O slots used by the Wang 2200 CPUs of 15 to 20 years earlier . ⇑ Georg Schäfer, private communication, email, ?? ?